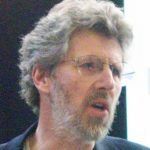 How do you describe how digital technology is being used in education in a way that is concise yet allows useful comparison across contexts? 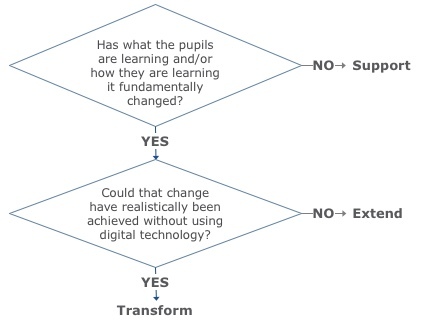 The Digital Technology Impact Framework highlights key elements of practice involving digital technology across three dimensions. The first dimension (Quantity) looks at the proportion of 'available study time' that pupils are using digital technology. Watching a teacher use an Interactive Whiteboard does not count as pupils using digital technology! 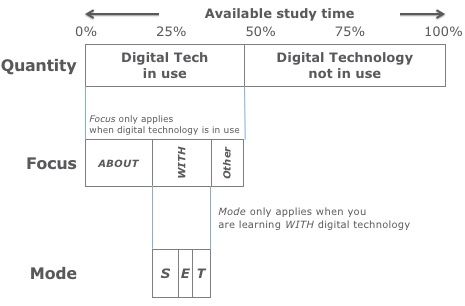 One way in which you can potentially change the impact of digital technology is to change the amount of time that students are using it - by changing the available study time and/or by changing the proportion of available study time when pupils are using digital technology. The Focus only applies when digital technology is in use (by the pupils). 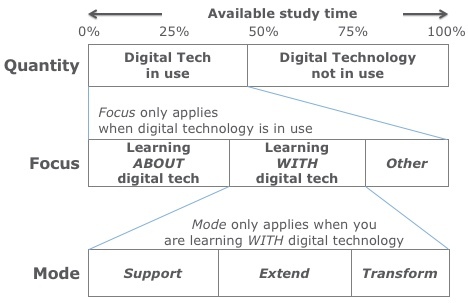 The Mode only applies if the Focus is on learning WITH digital technology.